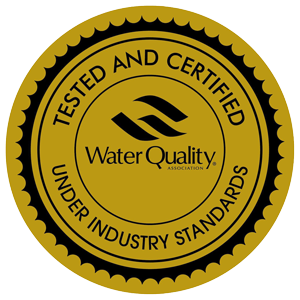 To explain why water softeners are beneficial and how they work, one needs to understand the differences between hard and soft water. It is presumed in this document that the water you are using meets all health regulations and is known to be safe. As Table 1 shows, water hardness is measured with five different classifications and can be expressed in mg/litre or parts per million (ppm) or grains per gallon (gpg). Sources of Hardness Water's hardness is determined by the concentrations of multivalent cations in the water. Multivalent cations are cations (positively charged metal complexes) with a charge greater than 1+. Usually, the cations have the charge of 2+. Common cations found in hard water include Ca2+and Mg2+. These ions enter a water supply by leaching from minerals within an aquifer. Common calcium-containing minerals are calcite and gypsum. A common magnesium mineral is dolomite (which also contains calcium). Rain water and distilled water are soft, because they also contain few ions. The following equilibrium reactions describes the dissolving/formation of calcium carbonate scales: CaCO3+CO2+H2O=Ca2++2HCO3−Calcium carbonate scales formed in water-heating systems are called lime scale. 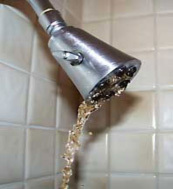 Calcium and magnesium ions can sometimes be removed by water softeners. 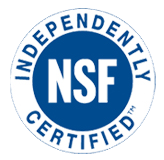 A water softener uses a media that serves to exchange "ions" of calcium and magnesium with sodium and potassium. To do the ion replacement, the water in the house runs through a resin bed of small plastic beads or zeolites. The beads are covered with sodium or potassium ions. As the water flows past the ions, they swap places with the calcium and magnesium ions. Eventually, the beads contain nothing but calcium and magnesium, and softening stops. It is then time to regenerate the beads or zeolites. To regenerate, the beads need to regain their sodium or potassium ions by being flooded with a salty, brine solution that is rich in sodium or potassium. Once Complete, the calcium and magnesium, dirt and sediments are flushed from the beads and into the drain in a process called backwash. The final phase rinses the media tank with fresh water and loads the brine tank so it's ready for the cycle. 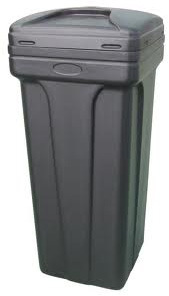 Automatic water softeners are usually programmed to recharge at specific times that will not disrupt the occupants. It is more water-efficient to have a metered model that will regenerate only when required. 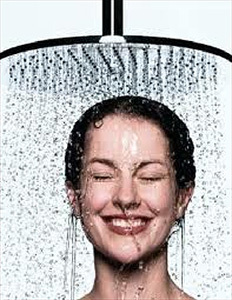 A water softener reduces water hardness, making it easier to shower and clean fabrics and dishes. 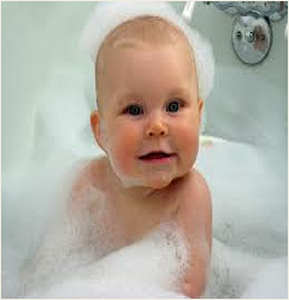 With soft water, less soap is needed for bathing and laundry. 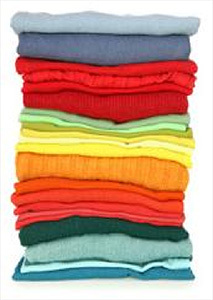 Skin feels cleaner and clothing softer. Pipes, fixtures and appliances have less scale build-up. With less build-up, appliances can operate efficiently. Mineral-derived odours may be reduced; and, there are fewer deposit stains on bathroom fixtures. Water softening is the reduction of the concentration of calcium, magnesium, and certain other metal cations in hard water. 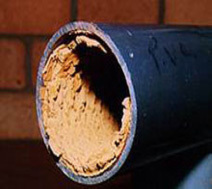 These "hardness ions" can cause a variety of undesired effects including interfering with the action of soaps, the build up of lime scale, which can foul plumbing, and galvanic corrosion. Conventional water-softening appliances intended for household, commercial & industrial use depend on an ion-exchange resin in which hardness ions are exchanged for sodium ions. 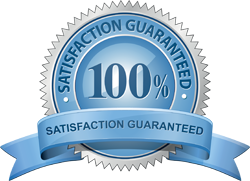 Water softening is desirable where the source of water is hard. 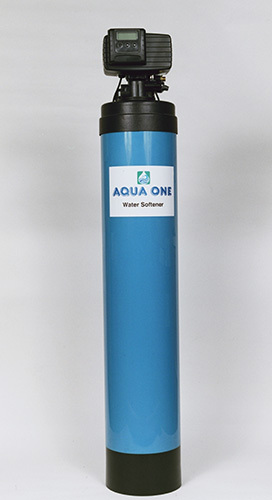 AQUA ONE water softener with GAC & KDF also removes chlorine, Chloramines, iron, Hydrogen Sulfide, Odor, Taste & potentially toxic metals ions such as lead and copper. Our water softeners are equipped with fully automatic metered & timer control valve & available in all sizes. Warranty: Electronics 5 years. Media, fiber glass tank & brine tank 10-15 years. What about KDF Process Media and Reverse Osmosis, Di Ionize and Ion Exchange systems? Reverse Osmosis (RO), Deionization (DI) and Ion Exchange (IX) systems benefit from the use of KDF Process Media because our Media allow these systems to tend to their strengths. Our Media protect RO systems from chlorine degradation and bacterial contamination, extending the life of the systems' membranes. KDF Process Media protect expensive IX systems from becoming fouled with chlorine, algae, fungi and bacteria. Less fouling, longer life and reduced maintenance, all combine for lower costs.